• A bachelor’s degree or higher in music therapy from one of an accredited schools. TEMPE – When Scott Tonkinson begins working with clients suffering from memory loss due to Alzheimer’s or another cause, one of the first things he does is strum a guitar or play his keyboard. 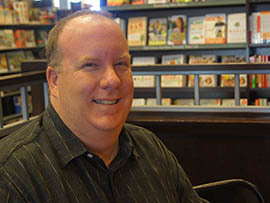 A video of him at work, in this case with a woman suffering from traumatic brain injury and needing help with speech and motor skills, shows Tonkinson start playing a Garth Brooks song. Three chords in, the woman starts moving her right arm to the rhythm. As he starts to sing, the woman sings along. As director of Arizona Music Therapy Services, Tonkinson helps clients rediscover lost memories and in the process improve their thinking, social skills, motor skills and more. “Music therapy in its simplest form is actually using music to help achieve therapeutic goals,” Tonkinson said. With more than 20 years of musical experience, Tonkinson switched careers after watching a special showing how music therapy was helping former U.S. Rep. Gabrielle Giffords, wounded in the 2011 Tucson shooting that killed six. The next day, Tonkinson enrolled in the music therapy program at Arizona State University’s Herberger Institute for Design and the Arts School of Music. ASU is the only university in the state offering a board-certified music therapy program, according to the American Music Therapy Association. The program consists of classes in music and psychology and how to apply both to an individual. A therapist is certified after completing a 1,200-hour internship under an experienced music therapist as well as being trained in voice, piano and guitar. Associate Professor Robin Rio said music therapy focuses on those three instruments because they are the most accessible but emphasizes the voice. Anna Philippe, a senior in the ASU program, said she originally was a design major but switched to music therapy to follow her passions of music and psychology. Currently enrolled in pre-clinical courses, Philippe is able to use her voice and guitar to work with clients. “I enjoy watching the journey the clients go on when I start with them, and when we’re finished how much growth I’ve seen in them,” she said. But music therapy is more than simply playing music. Alicia A. Clair, professor emeritus at the University of Kansas, said research supports the idea that music has healing properties. “Music moves across the brain and is processed by tapping with residual connections that create significant emotional responses,” she said. Clair said live music works best because a therapist can adjust to what an individual needs. “When using a headset, you could select the wrong tempo for a song, which could cause too much stimulation for the person,” she said. For Tonkinson, music therapy can include clients writing and singing their own songs. To illustrate, he showed another video in which the same client sings her song, “I am An Amazing Woman,” while he sings along and plays piano. A few notes in, the woman’s face lights up and she begins to move her right arm to the beat, something Tonkinson said shows that her brain is overcoming roadblocks caused by her injury. “When they close down due to a traumatic injury, music has a wonderful ability to be a catalyst to create a new pathway,” he said. Scott Tonkinson, a certified music therapist, speaks of his experiences and his sessions with one of his clients. 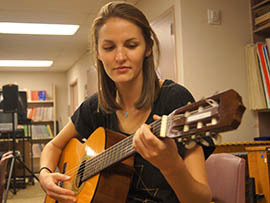 Anna Philipe, a senior in ASU's music program, practices a song on the guitar.